This is a MultiSemantics domain that contains a user-specified domain and a dataflow inner domain. The user-specified domain is used to calculate memory addresses, and the dataflow inner domain tracks dataflow across RISC operators (like the fact that if C = A + B then the definers for C are the union of the definers for A and B; or that if E = D xor D then E has no definers since it is a constant). State-accessing operations (reading and writing registers and memory) are handled above these two subdomains: read operations instantiate a value with a given set of definers, and write operations insert information into the final data flow graph. Definition at line 63 of file DataFlowSemantics2.h. Constructs a semantic framework for discovering data flow. The caller provides a semantic domain that is used to identify memory locations. Any domain can be used, but usually a SymbolicSemantics domain works best. Definition at line 85 of file DataFlowSemantics2.h. Run-time promotion of a base RiscOperators pointer to operators for this domain. This is a checked conversion–it will fail if x does not point to an object with appropriate dynamic type. Definition at line 112 of file DataFlowSemantics2.h. Clears the dataflow graph without affecting the user-supplied virtual machine state. Definition at line 122 of file DataFlowSemantics2.h. References Sawyer::Container::Graph< V, E, VKey, EKey, Alloc >::clear(). Definition at line 125 of file DataFlowSemantics2.h. Reads a value from a register. The base implementation simply delegates to the current semantic State, which probably delegates to a register state, but subclasses are welcome to override this behavior at any level. A register state will typically implement storage for hardware registers, but higher layers (the State, RiscOperators, Dispatcher, ...) should not be concerned about the size of the register they're trying to read. For example, a register state for a 32-bit x86 architecture will likely have a storage location for the 32-bit EAX register, but it should be possible to ask readRegister to return the value of AX (the low-order 16-bits). In order to accomplish this, some level of the readRegister delegations needs to invoke extract to obtain the low 16 bits. 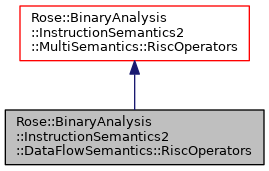 The RiscOperators object is passed along the delegation path for this purpose. The inverse concat operation will be needed at some level when we ask readRegister to return a value that comes from multiple storage locations in the register state (such as can happen if an x86 register state holds individual status flags and we ask for the 32-bit EFLAGS register). If the register state can distinguish between a register that has never been accessed and a register that has only been read, then the dflt value is stored into the register the first time it's read. This ensures that reading the register a second time with no intervening write will return the same value as the first read. If a dflt is not provided then one is constructed by invoking undefined_. There needs to be a certain level of cooperation between the RiscOperators, State, and register state classes to decide which layer should invoke the extract or concat (or whatever other RISC operations might be necessary). Obtain a register value without side effects. This is a lower-level operation than readRegister in that it doesn't cause the register to be marked as having been read. It is typically used in situations where the register is being accessed for analysis purposes rather than as part of an instruction emulation. Writes a value to a register. As with readRegister, writeRegister may need to perform various RISC operations in order to accomplish the task of writing a value to the specified register when the underlying register state doesn't actually store a value for that specific register. The RiscOperations object is passed along for that purpose. See readRegister for more details.